Use Propranolol as directed by your doctor.Take Propranolol by mouth with a full glass of water before meals. The extended-release (long-acting) product usually is taken once a day. Immediate-acting Propranolol may be taken two, three or four times a day. Take Propranolol on a regular schedule to get the most benefit from it. Take Propranolol exactly as directed. Do not take more or less of it or take it more often then prescribed by your doctor. Do not suddenly stop taking Propranolol. You may have an increased risk of side effects. If you need to stop Propranolol or ad a new medicine, your doctor will gradually lower your dose.If you miss a dose of Propranolol, take it as soon a s possible. However, if it is almost time for the next dose, skip the missed dose and continue your regular dosing schedule. Do not take a double dose to make up for a missed one. Do not store the tablets above 25 degrees. Store in a dry place. Protect from light. 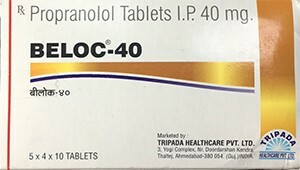 Do not use Propranolol after the expiry date which is stated on the carton.